Armed Robbers Attack Atta-Mills' "Camp"
Robbery was not politically motivated - ACP Boakye Accra, July 11, GNA - Mr Kofi Boakye, Greater Accra Regional Police Commander at the weekend described as false, claims that an attack by armed robbers at Osu on some guests of Professor Evans Atta Mills, National Democratic Congress Flag bearer was politically motivated. "I can say with all authority and experience that it was not politically motivated. I was personally involved in the investigations and was at the scene." 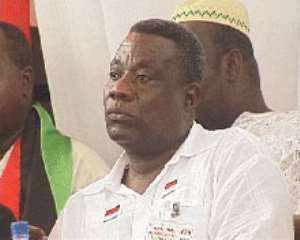 Mr Boakye, an Assistant Commissioner of Police, was speaking to the Ghana News Agency, in reaction to claims by Mr Victor Smith, Personal Aide to former President Rawlings, that the attackers were agents sent by the National Security Council to seize documents in relation to Prof. Mills' campaign for the Election 2004. Mr Smith had said that the victims, who were Nigerians, came to do some analysis for Prof Mills and had just returned to Accra from the Upper West Region, where they had met the NDC Flag bearer on his campaign trail. He claimed that the timing of the robbery and the fact that they took away all suitcases the victims had pointed to a conspiracy and the fact that the robbers were using AK 47 rifles. According to Mr Boakye the guns used by the robbers were G-3 and not AK 47 as alleged and that empty shells from the warning shots fired at the crime scene attested to this. He said on that night, the same gang also robbed a lady in front of the Wangara Hotel, at Labone. He advised party officials not to politicise crime since by so doing they gave a leeway for criminals to operate with impunity and to the chagrin of the public. ACP Boakye said the robbery was carried out by Ataa Ayi, who is "the most wanted armed robber in the country" for which 20 million cedis had been put forth as a reward for anyone who could give information leading to his arrest alongside Nii Mantse, Ahmed and Nii Armah.